The PO-32 is a fun and inspiring noise-maker and the added MicroTonic compatibility broadens its sonic scope considerably. Comes stocked with quality, characterful drum synth sounds. Performance effects are great - instant ’90s IDM! Workflow is a little fiddly and unclear. 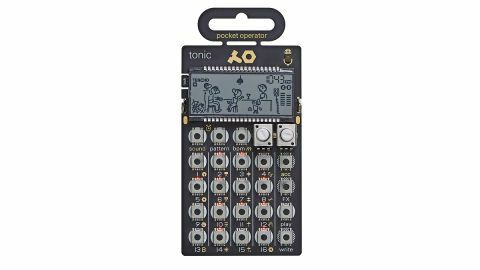 The PO-32 Tonic is the seventh addition to Teenage Engineering’s range of compact, battery-powered Pocket Operator grooveboxes. As with previous iterations, this PO packs 16 sounds, 16 performance effects and a 16-step sequencer into an exposed-looking hardware unit slightly larger than a credit card. However, where previous POs have been limited to a pre-defined range of sounds, this one is capable of a broader sound palette via some clever cross-platform compatibility. This flexibility is thanks to the fact that the PO-32 has been created in collaboration with Swedish developer Sonic Charge. The PO-32 takes both the ‘Tonic’ part of its name and the basis for its sound engine from Sonic Charge’s MicroTonic - a software drum synthesizer first released over a decade ago. The primary upshot of this is that, as well as coming stocked with an array of sounds created using MicroTonic, the PO-32 can be loaded with fresh sounds and patterns created using the plug-in, allowing users to completely alter and overwrite its sonic palette. This loading of sounds is made possible by the addition of a small microphone to the PO hardware itself. Information is transferred from plug-in to hardware as sound - using the harsh, tinny audio-data signals synonymous with old dial-up internet connections. To make a transfer, put the PO-32 into receive mode, hold its mic close to a studio monitor or computer speaker and let the retro protocol do its stuff. As the PO features a built-in speaker, it’s also possible to use the same method to transfer data from one unit to another, allowing users to clone a set of sounds or send creations to friends. It’s possible to make transfers via a wired connection too, by connecting a computer or PO output to the PO’s input jack - which is fortunate, as a few transfers will inevitably be enough to remind most users that the sound of dial-up internet was actually fairly irritating. Even ignoring the transfer capabilities, the PO-32 has a lot going for it. MicroTonic remains a quality drum synth (see MicroTonic), and its capabilities have been put to good use in stocking the PO-32 with factory sounds. The 16 sounds span bass-heavy kicks, fizzy white-noise hats, crunch snares and plenty of more esoteric, synthesized percussive sounds. Despite being fairly old in plug-in terms - the current iteration, version 3, arrived in 2011 - MicroTonic remains a powerful and well-designed drum synth. It features eight drum channels (compared to the PO’s 16 sound slots), each of which offers noise and oscillator sections for building sounds, along with various mixer, distortion and EQing tools. A morphing function allows users to set and transition between two different iterations of each sound, a feature which is carried across to the PO-32. There’s a sequencer too, which can send patterns to its hardware counterpart. As with the previous POs, each sound can be manipulated by a pair of parameter knobs. Here, these control the sound’s pitch and MicroTonic’s morphing capabilities. The latter of these allows each sound to smoothly transition between two pre-defined parameter set-ups, effectively meaning that each sound slot can contain two different drum sounds and a whole range of variations between the two. The PO’s Parameter Lock capability allows the movement of these two knobs to be automated on a per-step basis too. As is true of all the POs, the performance effects are the real star of the show here. The effects themselves cover rhythmic filtering, delayed fade outs, lo-fi and distortion effects, beat repeats and more. They’re a lot of fun to play around with and are capable of quickly conjuring up glitchy, stuttering sounds akin to classic ’90s IDM. MicroTonic compatibility aside, the workflow of the PO-32 is much the same as the other POs. As with those, there’s a lot of Shift presses involved to accommodate so much functionality into a fairly limited range of controls. A small screen offers some visual feedback - numerical bpm and shuffle settings, position of the two parameter knobs and a digital alarm clock - but screen real estate is mostly dedicated to a cartoonish animation, and on the whole it serves more of an aesthetic than a functional purpose. Labelling of the controls isn’t too clear either, meaning that you’ll want to memorise the manual to get the most out of the PO-32. This is all forgivable though, given the PO-32’s portability and price. As before, the PO-32 features a few tricks that allow it to integrate into a larger studio set-up. It can send and receive a pulse clock signal, allowing it to act as a master or slave when hooked up to other pulse compatible gear, such as other POs, Korg’s Volca range, Arturia’s analogue hardware or a simple pulse signal sent from an audio interface. It’s still a long way from being a properly integrated studio instrument, but the PO-32 is more capable than its disposable appearance might suggest. The MicroTonic compatibility adds to its creative scope considerably too. It’s a slight shame transfers aren’t bi-directional; the ability to send sounds and patterns back into the plug-in for deeper editing and DAW processing would really enhance its potential. Hopefully this might be something it’s possible to implement in a future update though. Detractors will still write this latest PO off as a ‘toy’ no doubt, but the PO-32 sounds great and, even if just as an inspirational source to sample, loop and churn out toplines, at £85 it’s worth the price of admission.